we gave a special night out as a present to nina's brother and his girlfriend. for this we needed a bit of preparation and some special items in our luggage. our destination was sittendorf, south-east of vienna, in the wienerwald. at a parking lot we met a few other guys, all waiting for our guide, who will teach us a lot of stuff for the next two days. and soon he arrived and guided us to a nearby forest glade to start the lessons. and so the survival training had started... our first lessons were to think about what is most important for survival in nature. it came down to water, body temperature, shelter, and food - pretty much in this order. although water is the most important thing, we started with building a shelter. we tried to build a bed made of stuff that is available in the forest that was around us. straight dry sticks, and tons of dried leaves to cover our skeleton tent and make it wind and a bit of waterproof. nina even could lie beneath the new roof, for me unfortunately it was a bit too short. then we were taught about the ways one could get drinkable water. from charcoal cleaning to getting the exhaustion water from leaves we discussed the pros and cons of each method. 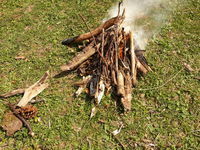 as one of the ways to purify water was to boil it, we then learned to make fire - in four different variations[02-10] the first method was to set fire to a heap of dry leaves and wood sticks. to manage the fire we were handed out two matches in a matchbox. considering it was pretty windy, this was quite a challenge. but soon a few heaps were smoking and a few minutes later they were all burning brightly. the second way to light a fire our guide called the "siberian fire", where you line up the dry wood and leaves with the wind, so the suction helps you to speed up the flames. again two matches had to do. the third version was using flint and steel and hygiene products for women. while getting sparks to smoulder the wool, it was hard to get it to grow to a full flame. so this took a few tries, but we finally managed to do that too. the last variant was a board of wood, a wooden stick and friction; and loads of it. 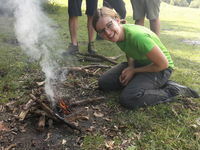 this was really the most exhausting way to get a flame but after using a string to speed up the rotation of the wood stick nina and i could get it working[16-18]. puh... to bring a lighter is way easier and less strenuous, and keeps you from getting blisters on your hands, like we did. 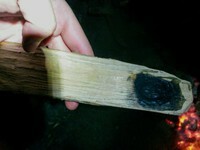 this is also what our guide recommended - when you go into nature, bring a lighter, a knife and a special tinder. this special lighter i a piece of wool (again this can be a female hygiene product) drenched in vaseline. it does not take much of it, to get a nice fire going, and also it does not take up much weight or space in your rucksack. so now that we had a shelter, and a fire going, the next thing to focus on, was getting something to eat. besides herbs, fruits, mushrooms, and berries we also could opt for the opportunity to try out to eat insects. i wanted this to do the first time i read about it on the website of our guide, nina was a bit sceptical at first but then also joined in. as did everyone else in the group. wow, we really were all surprised and impressed about ourselves. so we went to a nearby meadow to catch grasshoppers and locust. at first we all were a bit clumsy, but there were so many grasshoppers on this meadow, we soon have caught a few to line them up on our skewers made out of stronger blades of grass. while nina and i felt sorry for killing the animals, and thus apologizing to them before killing them fast with a twist of the head, that also removes the head at the same time, others soon went on a killing spree, with a spark of bloodlust on their face. when everybody had as many dead insects on their spits as they liked, we went back to the fireplace and roasted them like one would do with marshmallows over the open flames. the insects were crunchy, and tasted nutty - not bad in taste, but also not really a delicacy. 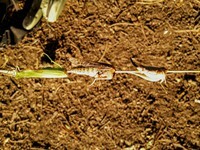 so for survival it would suffice, although catching them probably consumes more energy than you get out of eating them. so it is more for the variety of food you eat, rather than for lasting sustenance. then it was time for our real beds. they were the mats and sleeping bags everyone brought. to cover from rain, we were handed out tarpaulins we had to put over tightened cords which went from tree to tree. we secured them on the ground with stones or more cords, whichever was available. 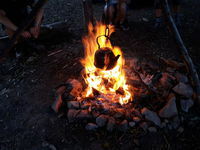 once this was done, we gathered around the fireplace again, and had some herbal tea, with leaves we collected during the day when exploring the area and looking for water sources. the tea was really good. then we also got "normal" food, as in bread and meat, fruits, and such. once everyone was well fed, we got a lecture on properly handling and holding a knife, which different knives there are, and which ones are best suited for survival needs. 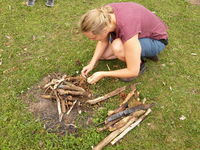 then we were invited to make our own wooden spoons with only a knife and fire. you start with a log that is split into the right size for a spoon and handle. then you start to outline the spoon with the knife. for the head we used glowing coals, that burns the shape of the bowl. once this is done, you start to smoothen things out with the knife again. nina and i did not quite finish our spoons, but the shape was already there, so maybe we finish it at home, once we get a proper woodcarving knife. later that evening, nina started to get sick (maybe because of the grasshoppers?). 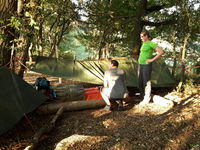 this did not get better during the night, so we had not much sleep under our tarpaulins. additionally it then started to rain, which was not helping either, but at least we did not get wet in our sleeping bags. the next day nina felt a little better. and after a breakfast with all participants of the course, we disassembled our camp, helped to bring all the stuff to the nearby cars, and then went home. so, if a zombie-apocalypse would be taking place any time soon, we should be prepared to survive in the wilderness on our own. at least in theory. hehe.